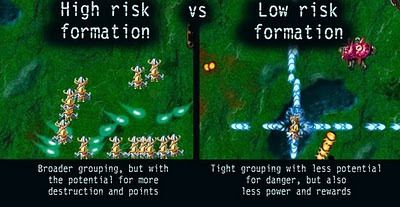 Offering gamers a choice between less risk but lower rewards and higher risk but higher rewards is what offers the fundamental addictive and exciting element in many games. 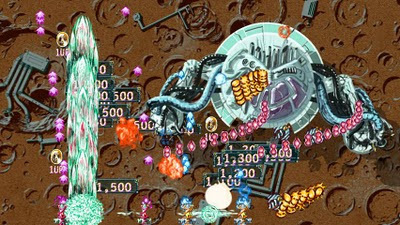 In Shoot 1UP, as you maneuver your ever-growing phalanx of ships you have some options controlling them. You can draw them together to be as small as a single ship, lowering the likely-hood that you'll get hit, or you can expand your fighters, increasing the possibility of one them being destroyed. Collapsing your ships is easy with the left shoulder or trigger. But you have even more control in the form of the X button which puts on the ships' air brakes, causing you to move a third of your normal speed and granting you finer movements to dodge incoming bullet swarms and enemies. If you do choose to expand your ships, which is easily performed on the fly via the left shoulder or trigger, you are rewarded in several ways. First, shown on the HUD via a row of icons is the "spread gauge" which directly reflects your "spread multiplier". Each enemy you kill grants you a given amount of points. But if you kill an enemy with your spread multiplier active (showing at least one pip), you now cause them to drop a "points medal" which you can catch for higher scores. The bigger your spread, the higher the multiplier can get--all the way up to x30. As your ships spread out more, it makes it easier to catch the point medals, but again scarier because you're more likely to crash. The most exhilarating reason to expand your ships is to activate the Plasma Auger. Once you've gained at least two ships, you can now fire the Plasma Auger by holding down the fire button though it takes a moment to warm up. You must have your spread multiplier (and your ships) expanded to the fourth pip, signified by being brighter and whiter. This giant stream of destruction can go from very small to very wide, and increase in damage all based on how you use it. For the more skilled player, the Plasma Auger doesn't require more ships to increase in size and damage--it only needs a bigger spread multiplier. The best way to get that is to keep your ships circular (or simply diagonal) and watch your hud for feedback. The Plasma Auger is available in 2 player as well, and even possible with the Ghost powerup. Grab a buddy and start playing for a total of 3 enormous pillars of alien-rending energy! We avoided launching the game this week (Jan 25th) so as not to be devoured by ME2. With that in mind, Shoot 1UP should be firing it's way your Xbox 360 by early February (possibly within a week)! Weapon of Choice has a pretty elite rating. Looks interesting, definitely will check it out when it's released. 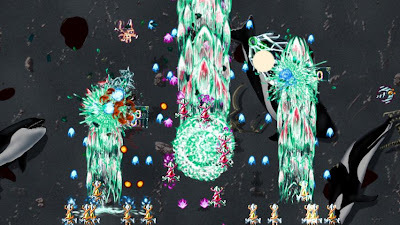 XBLIG could definitely use another good shmup.